The Grito de Dolores (“Cry of Dolores”), was uttered from the small town of Dolores, near Guanajuato in Mexico, on September 16, 1810. It is the event that marks the beginning of the Mexican War of Independence. The “grito” was the pronunciamiento of the Mexican War of Independence by Miguel Hidalgo y Costilla, a Roman Catholic priest. Since October 1825, the anniversary of the event is celebrated as Mexican Independence Day. Hidalgo and several criollos were involved in a planned revolt against the Spanish colonial government, when several plotters were killed. Fearing his arrest, Hidalgo commanded his brother Mauricio, as well as Ignacio Allende and Mariano Abasolo to go with a number of other armed men to make the sheriff release the pro-independence inmates there on the night of 15 April. They managed to set eighty free. 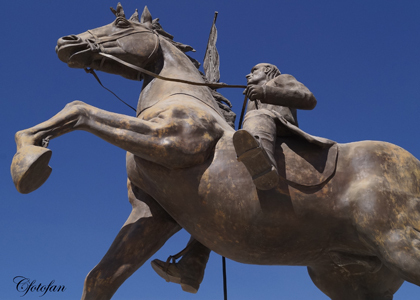 Around 6:00 am on September 16, 1810, Hidalgo ordered the church bells to be rung and gathered his congregation. Flanked by Allende and Juan Aldama, he addressed the people in front of his church, encouraging them to revolt. The Siege of Guanajuato, the first major engagement of the insurgency, occurred 4 days later. Mexico’s independence would not be effectively declared from Spain in the Declaration of Independence of the Mexican Empire until September 28, 1821, after a decade of war.This event has since assumed an almost mythic status.Since the late 20th century, Hidalgo y Costilla’s “cry of independence” has become emblematic of Mexican independence. Each year on the night of September 15 at around eleven in the evening, the President of Mexico rings the bell of the National Palace in Mexico City. After the ringing of the bell, he repeats a shout of patriotism (a Grito Mexicano) based upon the “Grito de Dolores”, with the names of the important heroes of the Mexican War of Independence who were there on that very historical moment included, and ending with the threefold shout of ¡Viva México! from the balcony of the palace to the assembled crowd in the Plaza de la Constitución, or Zócalo, one of the largest public plazas in the world. After the shouting, he rings the bell again and waves the Flag of Mexico to the applause of the crowd, and is followed by the playing and mass singing of the Himno Nacional Mexicano, the national anthem, with a military band from the Mexican Armed Forces playing. This event draws up to half a million spectators from all over Mexico and tourists worldwide. On the morning of September 16, or Independence Day, the national military parade (the September 16 military parade) in honor of the holiday starts in the Zócalo and its outskirts, passes the Hidalgo Memorial and ends on the Paseo de la Reforma, Mexico City’s main boulevard, passing the El Ángel memorial column and other places along the way. A similar celebration occurs in cities and towns all over Mexico, and in Mexican embassies and consulates worldwide on the 15th or the 16th. The mayor (or governor, in the case of state capitals and ambassadors or consuls in the case of overseas celebrations), rings a bell and gives the traditional words, with the names of Mexican independence heroes included, ending with the threefold shout of Viva Mexico!, the bell ringing for the second time, the waving of the Mexican flag and the mass singing of the National Anthem by everyone in attendance. There are also celebrations in schools as well all over the country. In the 19th century, it became common practice for Mexican presidents in their final year in office to re-enact the Grito in Dolores Hidalgo, rather than in the National Palace. President Calderón officiated at the Grito in Dolores Hidalgo as part of the bicentennial celebrations in 2010 on the 16th of September, even though he had to do this first, to launch the national bicentennial celebrations, in the National Palace balcony on the night of the 15th. As a result, the 2012 commemoration, his last as President, was held in the National Palace balcony instead, thus becoming the third President breaking the traditional practice. The following day, September 16 is Independence Day in Mexico and is considered a patriotic holiday, or fiesta patria (literally, Patriot Festival or Civic Festival). This day is marked by parades, patriotic programs, drum and bugle and marching band competitions, and special programs on the national and local media outlets, even concerts. This entry was posted in captures, cultura, culture, diversión, fotografías, fotos, fun, gallery, historia, history, Images, imágenes, photos, pictures, travel and tourism, turismo and tagged 16 de septiembre, Cradle of Independence, Cuna de la Independencia, Dolores Hidalgo, Gto., Guanajuato, Miguel Hidalgo. Bookmark the permalink.